At the center of "Two Men of Florence" lies a gripping idea for a play: the battle between Galileo and the Roman Catholic Church. But around that idea revolve so many dense speeches, stock characters, and heavy-handed displays of stagecraft that the center cannot hold. Richard N. Goodwin, the noted speechwriter and political observer, has said that he was drawn to the figures of Galileo and his ecclesiastical opponent, Pope Urban VIII, in part because they were not so different as they appear to us today: The pope was a man of intellect, the scientist a man of God. From this idea Goodwin developed his play, produced in England as "The Hinge of the World" and now making its US debut at the Huntington Theatre Company as "Two Men of Florence." If only the play were simply these two men of Florence. Their argument - over whether, as Copernicus posited, Galileo argued, and Urban disputed, the earth revolves around the sun, in apparent contradiction of the Bible and church doctrine - is a turning point in the road to modernity, and the details of their battle are more complicated than we remember from grade school. Galileo did, after all, recant (though it's unclear whether he actually went on to whisper, "e pur si muove" - "nevertheless, it moves" - and he doesn't do so here). Moreover, Goodwin reveals both men as fascinating and complicated human beings, full of intellectual curiosity and spiritual passion. But he has also surrounded them with a small army of secondary characters - priests, Cardinal Richelieu, Galileo's daughter the nun, hooded monks, Johannes Kepler - and then loaded them down with more argument, exposition, and flowery description than any characters on earth could carry. What's frustrating is that, buried under the barrage of words, there are some wonderful lines. Even Kepler gets one: Describing Galileo's unprecedented use of experiment and observation, rather than unaided reason, to study the universe, he says: "Now God has found himself a philosopher with hands, and we begin to understand the wonders of Creation." "A philosopher with hands" - such a neat distillation of Galileo's gifts. But the phrase is hidden in a full paragraph of speech, which itself is stuck in the middle of a whirl of vignettes that take us from Tuscany to France to who knows where for a glimpse of reactions to Galileo's work in each spot. Some of the busyness, no doubt, can be attributed to director Edward Hall, who worked with Goodwin on the original production and has restaged it here, complete with a dizzyingly effective turntable, myriad stars and candles, and all the sumptuous robes a pope could desire - all exquisitely designed by Francis O'Connor, with lights by Ben Ormerod. But the turntable and the stars and the rest are all what the script demands, and while they're sometimes visually striking, the stage effects don't build to create an emotional one. As with the design, so with the acting: There's a great deal of technical proficiency on display, but that's not enough to engage us with the play on a deeper level. We can admire the actors' skill in dealing with the rotating platform and the dangling lights - and admire even more their ability to give shape and dynamic variety to these huge mouthfuls of words - but we are rarely, if ever, free to relax into the play and just let it take us along. Jay O. Sanders brings great energy and vivacity to the bearish, bearded Galileo; Edward Herrmann is generally more subdued, and often more quietly effective, as his admirer-turned-adversary Urban VIII. But Herrmann also has the less cliched role: We don't often see a stage pope who's allowed to have a brain (even if he ultimately refuses to use it), while the inspired, scorned, impatient, charismatic genius is all too familiar a figure. 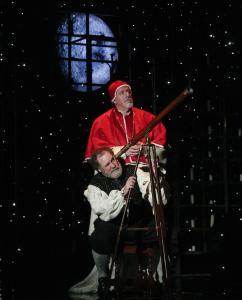 Goodwin has played a little loose with history in making Galileo's illegitimate daughter his lab assistant, rather than a cloistered nun, but the role of Sister Maria Celeste brings a welcome break from the otherwise all-male cast, and Molly Schreiber invests the character with a subtle piety and glowing intelligence that make her a worthy companion to the Catholic scientist. Galileo's and Maria's scenes together also tend to have a lighter, less didactic tone - though even they are sometimes underscored with the crashingly literal, movie-style music of Simon Slater that punctuates most of the play's turning points. "Two Men of Florence" has flashes of engaging argument, loads of historical detail, and a few dazzling moments among the stars. Nevertheless, with apologies to Galileo, it does not move. Directed by: Edward Hall. Set and costumes, Francis O'Connor. Lights, Ben Ormerod. Sound, Matt McKenzie. Music, Simon Slater. Presented by: Huntington Theatre Company.